what’s a girl to do? Maybe it’s time to start thinking about having the love you really want. 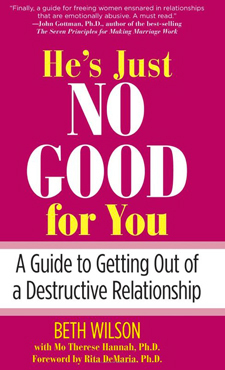 In He’s Just No Good For You, I talk about lies and deception—women’s kryptonite—and other red flags to look out for when getting involved with a man as well as watching out for “the dirty dozen”—profiles of twelve types of men you want to avoid. Does the man you’re with/dating take your opinions into account? Does he respect your choices even if he expresses concerns or differing views? How does he handle conflict? Is he prone to lying and mind games or answers you honestly? Does he do things to make you feel secure in the relationship or does he purposefully disrupt your bond by engaging you in crazy-making arguments, peppering his words with cutting comments or by manipulating you to throw you off-balance? Remember, all relationships take some work, but the good ones have flow, they’re loving despite occasional ups and downs….you don’t spend so much time trying to recover from abusive, crazy-making behavior. Instead, you have time for romance, family time, laughing at each other’s jokes, making love and growing closer, together. “Women of all ages need to read this book! Beth brings a fresh approach to the topic and a compassionate voice, focusing on women’s empowerment and learning to trust ourselves, especially in relationships.” —Lisa Frederiksen, author of If You Loved Me, You’d Stop!